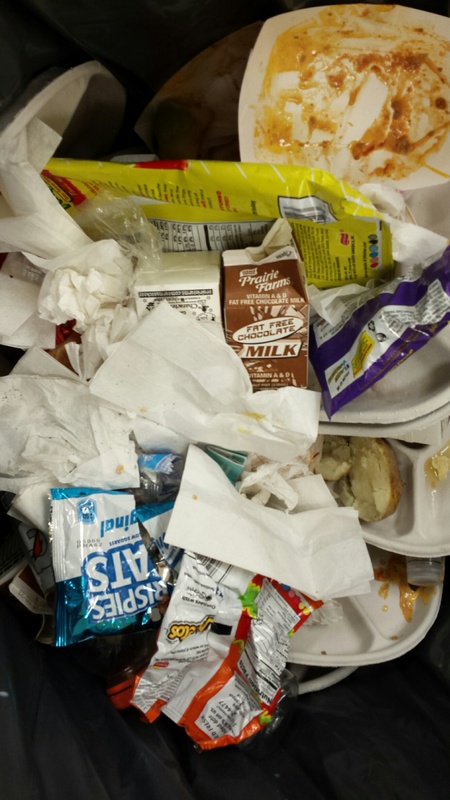 Is a national policy on school milk boosting lunchtime waste? Students and parents at a Chicago public school say that when kids just want a single part of a meal--like a milk to go with a home lunch--they are pushed to take an entire free lunch. The full meal triggers payment from the federal government. Some think this could be generating a lot of food waste in schools. One day this fall, first grader Russell Muchow brought his usual bagged lunch from home to Kellogg Elementary School in the far Southwest Side Beverly neighborhood. Muchow says she called up the Kellogg school lunch director (Chicago Public Schools officials did not respond to WBEZ requests to interview the lunch director.) and basically got the same message: kids can’t take free milk unless they take the whole meal. This may sound outrageous from a food waste perspective, but from a school money angle, it’s true. That’s because for each child who takes the full meal — which includes an entree with milk and a side of fruits or vegetables — the U.S. Department of Agriculture pays CPS $3.15, which it shares with the food service company Aramark. But if a child just takes a milk, the district and Aramark get nothing from the feds. The situation recently dominated a Kellogg Local School Council meeting, but it’s an issue that’s rooted in federal policy. "In order for it to be a reimbursable meal by USDA the lunch needs to include all the meal components," explained USDA regional administrator Tim English. "And that would be a grain, vegetable or fruit, milk and meat or meat alternate. The idea is that we want to provide kids who are taking school lunch with a well-rounded meal." But it means kids who just want an egg or banana at breakfast, for instance, must take the rest of the meal, even if it’s tossed in the garbage. Starting last school year, most districts across the country like Chicago’s, with a lot of low-income students, adopted the Community Eligibility Provision. That’s a USDA program that makes all meals free to all students in the school or district regardless of income. This reduces mountains of free lunch application paperwork and the need to collect money in the lunchroom. Students still have the ability to pay 45 cents for milk out of pocket each day. But Northwestern University economist and professor of social policy Diane Whitmore Schanzenbach says the policy doesn&apos;t make that likely. “Under these circumstances, if you’re getting the same thing and you can choose to pay for it or you can choose to get it for free the vast majority of people will choose to get the same item for free instead of paying for it,” she said. That policy change would require an act of Congress — which happens to be reviewing the rules around school lunch right now, albeit at a slow pace. There is, however, a window for a quicker fix. 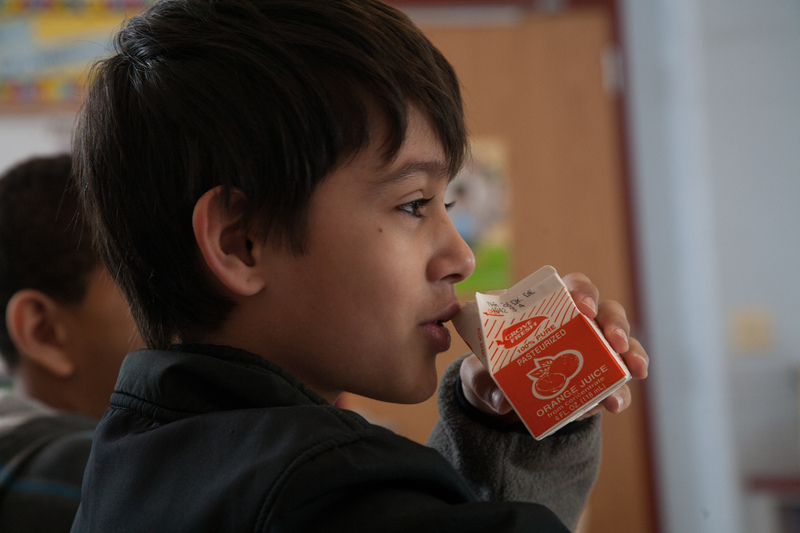 CPS could choose to pick up the 45 cent tab when a student wants just a milk, making the less wasteful option an easy option (We found at least one district in Ohio where the superintendent says he decided to start doing this two months ago in response to food waste). Still, CPS rejects the idea, saying it would just cost too much. And, to be fair, this appears to be the stance of most districts across the nation, according to Tim English, the USDA director for the Midwest. So if free milk won’t be an option in the district, how are the existing choices presented to students? Are kids told they can bring money to buy a milk? Are they encouraged to take more than they want? We asked CPS to explain exactly how lunch staff are told to present the options, but officials would not talk to us about it. The district also would not give us permission to talk to the Kellogg lunch staff about the procedure they follow on the matter. Kellogg parent Jill Zayauskas says she pretty clear about the way the options are handled at her school, and it makes her mad. About half of the money for each meal goes to food service company Aramark, which receives $1.31 for each lunch taken. Kellogg mom Emily Lambert says students are getting mixed messages, right when they’re in the middle of a food drive. The USDA is also in the middle of its own campaign to reduce food waste by 50 percent in 15 years.